Esmark Finch Win Print Business Innovation Award For Sustainable Packaging. 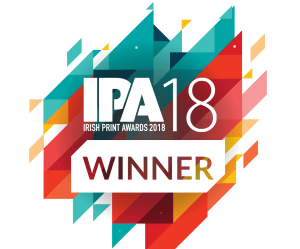 It is that time of year again, The 2018 Irish Print Awards. These esteemed Awards aim to recognise the country’s best companies in the print and press sector. Esmark Finch were nominated for an amazing six categories in this years awards and the staff suited up for the big night out. Esmark Finch were delighted to win an award for ‘Print Business Innovation’ for our work with Earth Pact Naturel material. The category was a competitive one. Judges were asked to assess jobs that demonstrated high levels of innovation. 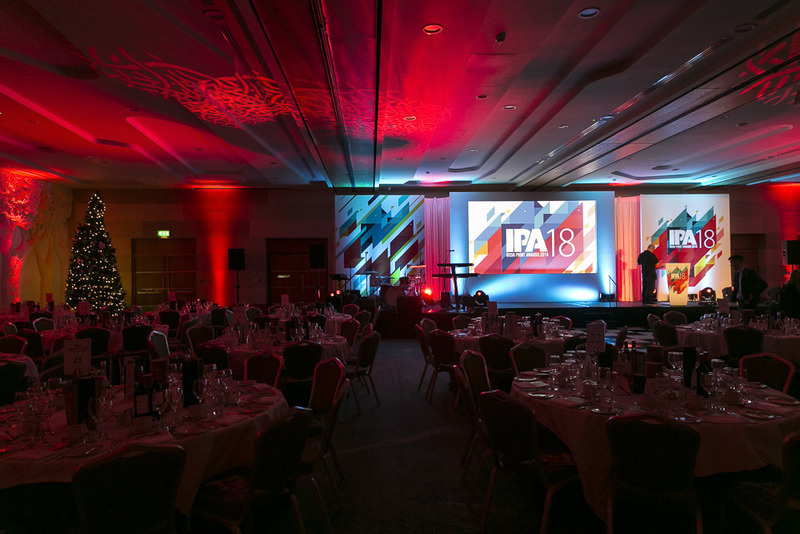 This included the use of new technical developments within printing, or the use of a difficult substrate and were looking for entries that displayed a creative or innovative approach to a print job. 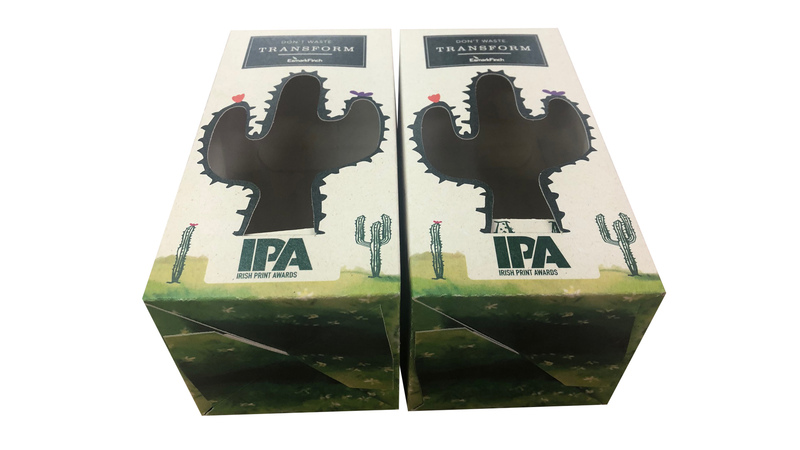 We listened to our clients concern when it came to sustainable packaging solutions for their products and we invested in Earth Pact Naturel Material. On average 20% of the plant is used for food and the remaining 80%, the stems and leaves, of the plant are considered agricultural waste. This material gives a second life to this waste by transforming it to raw material for paperboard. Esmark Finch production team put the material through a rigorous testing phase in our IGen machine to ensure it produced the highest quality results. 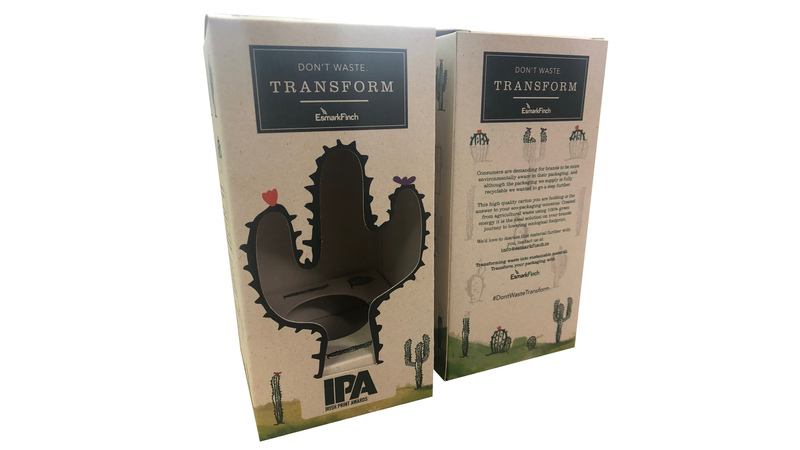 We then launched the material with our clients by running a Halloween campaign ‘Don’t Waste, Transform’ where we created a carton with the material with a cactus inside for clients. You can read more about this eco-friendly material here! 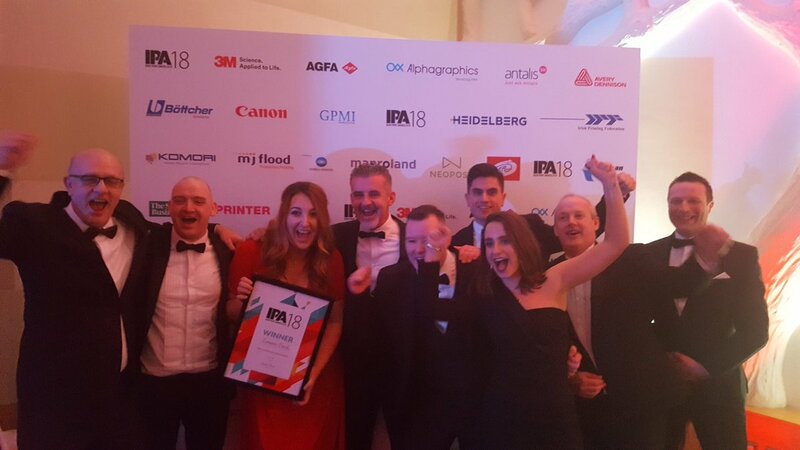 We entered this campaign into the category for Print Buniness Innovation Award and we’re thrilled to be announced the winner on the night. We are honoured to be recognised in this category as we continue to strive to find sustainable solutions for our clients packaging needs. Winning the ‘Print Innovation Award’ is a testament to Esmark Finch culture of innovation, client centricity, and overall values. Well done to the whole Esmark Finch team for all their hard work and dedication and a huge congratulations to all the nights winners and the Print Awards organisers for a great night. We’re already looking forward to next years event!